Our theory about where Conan O'Brien got the Bugatti for his crazy expensive sketch was correct. We now have confirmation from the Petersen Automotive Museum that they did loan the car to the Tonight Show for last night's sketch. 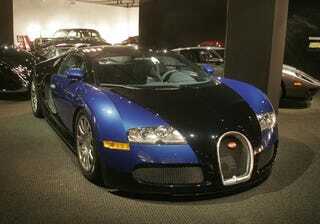 Where Did Conan Get That Bugatti Veyron? Smart move on the part of the Petersen Automotive Museum. You think that Veyron was worth a lot before? Now imagine how much it's worth after it participated in television history. Any guesses on how it'll affect the value?